Of course, that’s easier said than done when he has superpowers and can move at mach 20. Recently, a lot of popular anime and manga have been getting live-action adaptations. Many of these have turned out to be lackluster. However, Assassination Classroom bucks that trend by creating a film that is true to the spirit of the original—even if it doesn’t hit every plot point note for note. The setting of the Assassination Classroom film is identical to that of the manga it is based on. A monster has destroyed a large portion of the moon. In one year’s time, he will destroy the earth—unless someone is able to kill him first. However, in the meantime, the monster has decided to take a job teaching a high school class of misfits. The government then tasks these children with killing their eldritch teacher and saving the world. 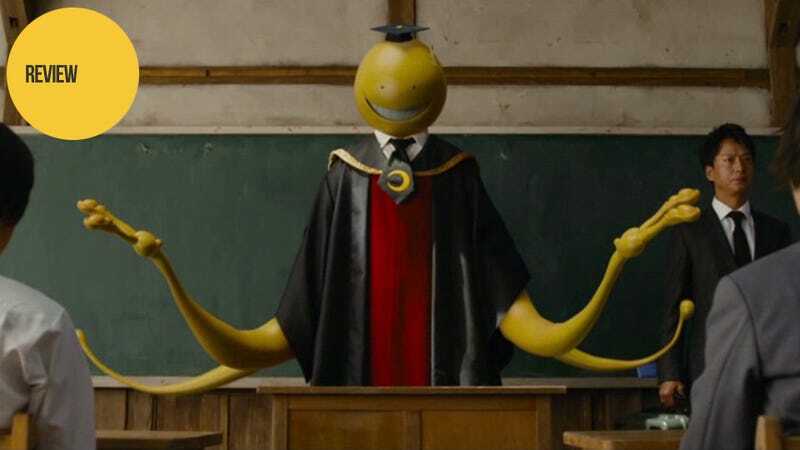 There is just one problem: this monster (which the class dubs “Koro-sensei”) is the best teacher any of them have ever had. But while the setting is the same, the order of events is vastly different. Basically, the film spends its opening scenes introducing as many of the characters as possible: Nagisa, the bookish boy who serves as the class’s strategist; Karma, the smartest and most devious boy in class; Ritsu, an AI assassination machine; Itona, Koro-sensei’s “little brother”; and the class’s other teachers. From there, the film shows the students’ various assassination attempts in brief, five-minute (often comical) scenes or otherwise furthers the main plot. Thematically, Assassination Classroom shares much with classic manga/anime/drama GTO. It is the story of a teacher who, despite having little to nothing in common with his students, cares about them on a deep level and is willing to put in the hard work to draw out their potential. While often used for comedic effect—as Koro-sensei is basically training the students one by one to assassinate him while outthinking them in the end—these short scenes are generally touching. Moreover, while the students increasingly come to like Koro-sensei, the fact of the matter is they must kill him to save not only their own lives but the world as well—making any potential victory more and more bittersweet as time goes on. In order to fit even part of Assassination Classroom’s massive plot into the length of a feature film, the story has been tightened up and streamlined extensively. Major plotlines—i.e., anything having to do with the rest of the school—is largely absent. Moreover, the film takes place almost entirely at the school—keeping the setting static and familiar. And by focusing on the threat of antagonists Itona and deranged drill sergeant Akira Takaoka as the story’s main conflict, the overall film feels like a complete story despite the “to be continued” at the end of the movie. The only real problem with how the story is told is the addition of the film-only character Ayaka. Ayaka is one of Nagisa’s old friends before he was put in the misfit class at school. Like the rest of the students at the school, she treats Nagisa like a pariah—though with a great deal of reluctance. She pops up again and again throughout the film, often exchanging a lingering look with Nagisa, but rarely anything more. However, nothing comes from these encounters—there is no resolution where she apologizes to him, stands up for him, or even ignores what the rest of her classmates think so as to rekindle their friendship. Instead, the plot thread is just left dangling, making it hard to understand why it was added to the film in the first place. Visually, the film is a decent match to the source material. Koro-sensei himself looks great—and while his giant yellow head and tentacles are obviously CG, it is hard to tell if his robes are or not. Koro-sensei’s superpowers showcased in the various attempts on his life are likewise impressive. The young cast also does a decent job of realistically playing off the CG teacher—though there are a few scenes in which Koro-sensei is darting back and forth while the students shoot at him, and the students are clearly aiming and shooting at nothing. The other possible thing of note is that while many of the students look like their manga counterparts, some—like Nagisa—look completely different. It isn’t bad necessarily, but it does stand out to anyone who has read the manga or seen the anime. While heavily altered from the source material, Assassination Classroom is not only a good adaptation but an enjoyable film on its own. It has believable CG effects, a strong cast, and a streamlined plot that despite its differences still feel true to the name “Assassination Classroom.” All in all, it’s a film that leaves you wondering how a comical film about assassination can be so touching.